The sun’s light grows weaker with each new day as the shadows begin to lengthen, reaching to catch an unwary traveler in their grasp. A creeping mist rises from the ground and curls around your ankles, waiting for the time when it can tighten its grip and pull you to the realm of nightmares. The creatures that dwell just out of sight have been waiting patiently, and soon their moment will arise. In one week, Arkham Nights 2018 will be held from October 19 – 20 at the Fantasy Flight Games Center in Roseville, MN! We invite you to join in the revelries and unite with investigators from across the mythos during the ultimate celebration of Lovecraftian horror. Even if you missed pre-registration, you can still attend the event and register onsite! At Arkham Nights 2018, you will have a chance to play demos, receive exclusive gifts, and meet the designers who bring your favorite Lovecraftian games to life. The highly anticipated Arkham Horror Third Edition will be featured, as well as Arkham Horror: The Card Game, Elder Sign, Eldritch Horror, End of the World: Wrath of the Gods, and Mansions of Madness. The maddening event begins on Friday, October 19 at 4:00 P.M. To open the event, on Friday night, Kevin Wilson will be there to meet with investigators and sign autographs. Richard Launius will also be in attendance, along with his original prototype for Arkham Horror. You will have a chance to peer into the past, looking at where it all began, and then play a game of Arkham Horror First Edition with Launius himself on a giant game board! The results that players obtain at Arkham Nights 2018 will affect all players of Arkham Horror: The Card Game, adding one of three possible basic weaknesses to a future scenario. Participating investigators will also receive a brand-new extended art promo card! To kick off the event on Friday night, 24 lucky attendees will have the chance to participate in one of two Card Councils with developers Matt Newman and Daniel Schaefer where they will work together to design a brand-new weakness and player card for Arkham Horror: The Card Game! These cards will then be printed at Fantasy Flight Games’s print-on-demand factory and handed out to every attendee on Saturday. Also on Saturday, the hour arrives for you to don your flapper dresses, trenchcoats, cloaks, and pallid masks for the Arkham costume contest, beginning at 7:00 P.M.! 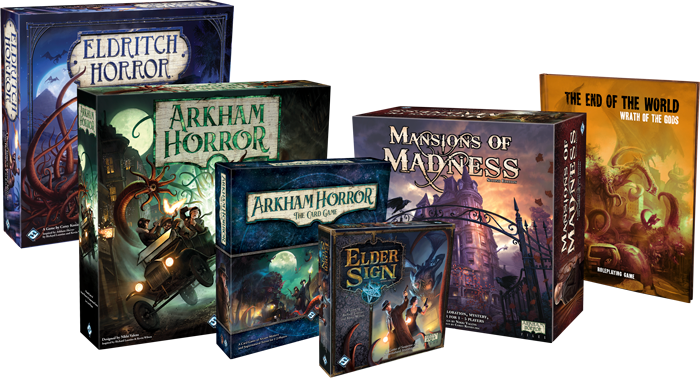 For those who cannot attend Arkham Nights this year, we will also be livestreaming several of the events, including Arkham Horror Third Edition, Mansions of Madness, and Arkham Horror: The Card Game, so even if you cannot attend in person, you can still be part of the madness! Follow us on Twitch to catch all of the livestreaming action. 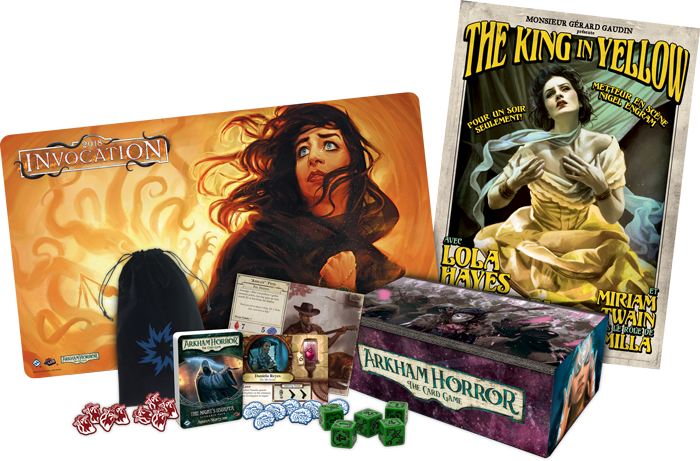 In addition to the cards created at the council, each attendee will receive a gift bag filled with macabre mementos of madness, and just for Arkham Nights 2018, we have included two brand new items! 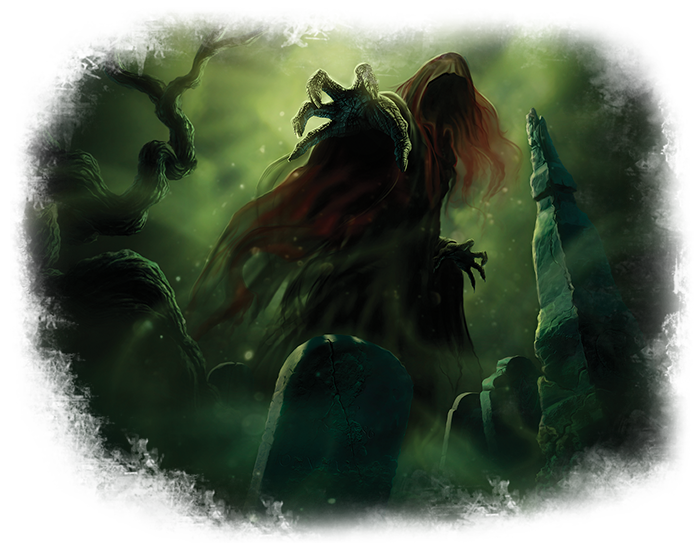 As mentioned in our announcement article, you will gain an exclusive velvet bag with an eldritch emblem emblazoned on it, a collection of acrylic health and sanity tokens, a promotional character for Arkham Horror Third Edition and one for Elder Sign, and The Night’s Usurper scenario pack for the Arkham Horror: The Card Game. But beyond these implements, you will also receive an exclusive poster and playmat! 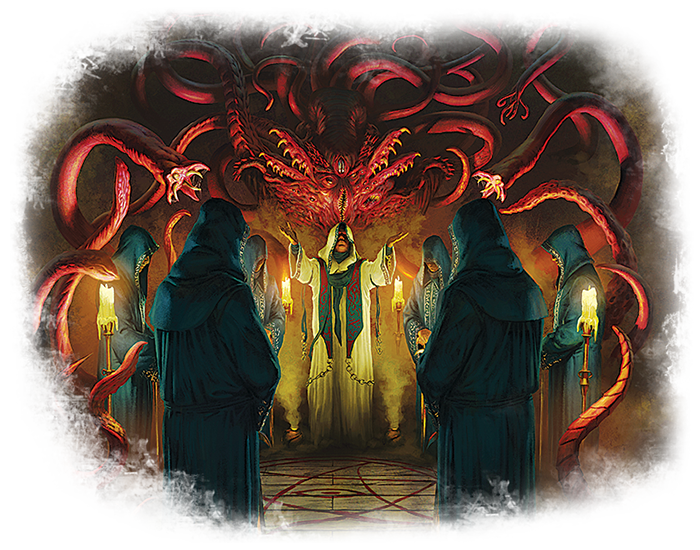 Investigators familiar with The Investigators of Arkham Horror may recognize the promotional poster for the haunting play The King in Yellow, director Nigel Engram’s greatest triumph. Investigator Lola Hayes is set to star as the regal and tragic Cassilda, but as the production seems cursed by tragedy and misfortune, it remains to be seen whether the play will ever reach the stage for its one-night engagement. 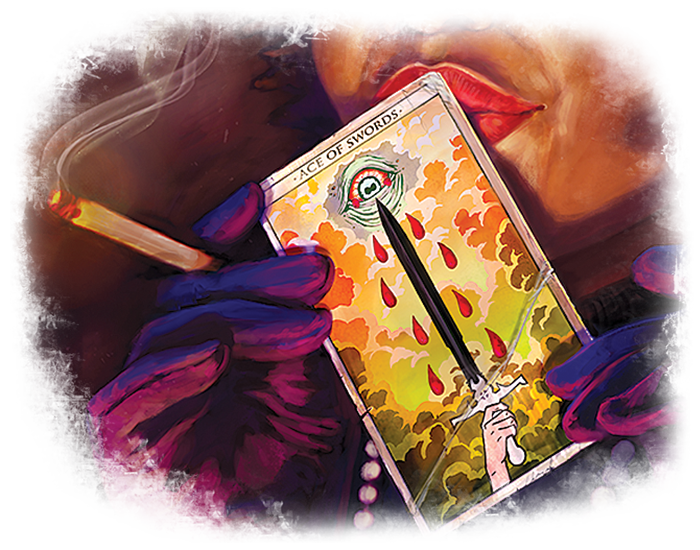 Then, in the spirit of The Night’s Usurper, the playmat included in your collection of arcane implements features gorgeous artwork reminiscent of the mysteries in Cairo. The 24” x 14” mat provides a high-quality, slip-resistant rubber base to display your cards in style, whether you're participating in a tense Invocation Event or summoning eldritch monstrosities from the comfort of your own home. Are you ready for Arkham Nights 2018? October 19 is quickly approaching, so mark your calendars, brush up on your arcane texts, and steel your nerves to stand against the power of the mythos! Arkham Nights 2018 will be held from 4:00 P.M. on October 19 to 11:59 P.M. on October 20 at the Fantasy Flight Games Center in Roseville, Minnesota! Tickets are available onsite.